At the Law Offices of Melanie Tavare, we understand that any legal proceeding can be stressful. Having to appear in front of a judge can be overwhelming, but having an experienced attorney who knows the local court culture goes a long way in alleviating that stress. Most debtors will never have to appear in front of the bankruptcy court, but for those that do, having excellent legal representation can make the difference between a fresh start or the dismissal of your bankruptcy case. The United States Bankruptcy Court was created by an act of Congress in 1978 under Article 1 of the United States Constitution. 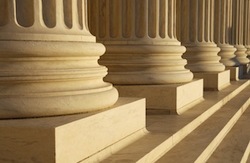 Federal District Courts have jurisdiction over bankruptcy cases, however most Districts refer their bankruptcy cases by a standing order to Bankruptcy Court. This means that most bankruptcy cases will almost exclusively be handled by the Bankruptcy Court and not the Federal District Court. Will I Have To Go To Bankruptcy Court? This occurs when a creditor or the Chapter 13 Trustee has objected to the plan filed by the Debtor. If the objection cannot be worked out beforehand, then the Debtor will need to be present at a Confirmation Hearing where their attorney will make arguments as to why the plan should be confirmed. The bankruptcy judge will then decide the issue. In some extreme cases a creditor or the Chapter 7 or US Trustee may object to the entire discharge of the client’s debt. Most often this occurs when the moving party believes that the debtor has engaged in fraud or has otherwise been dishonest in their bankruptcy papers. If an agreement cannot be reached then the Debtor and their attorney will go before the bankruptcy court and have the judge decide. When you file bankruptcy, an automatic stay goes into effect which prohibits any of your creditors from attempting to collect money or assets from the bankruptcy estate. In some cases, the creditor will move the court to lift the automatic stay so they can take collection action against a certain asset. If you object to this and an agreement can’t be worked out, the bankruptcy court will decide the matter. It is often recommended the Debtor attend these hearings with their attorney. One of the most common reasons a motion to dismiss is filed in a Chapter 13 case is because the Debtor has fallen behind on their Chapter 13 plan payments. If the Debtor and the Trustee cannot agree on a resolution to the payment deficiency, there will be a hearing before the bankruptcy judge who will decide whether the case should be dismissed or the Debtor should be given more time to catch up on their payments. Don’t go before the bankruptcy court unprepared. Hire an attorney who has the experience you need to get the best result. Contact the Law Offices of Melanie Tavare today for a free consultation.